Italian painter, active in Padua. He is an enigmatic figure, who is important in terms of the pupils he trained, rather than for his own work. A Paduan writer of 1560 patriotically described him as a famous and benevolent master, with many pupils (according to Vasari, he trained 137) and a large collection of antique sculpture gathered on youthful journeys through Greece and Italy. More recent research, however, gives a picture of a tailor who, turning painter in his middle thirties, was for many years discreditably involved in a series of lawsuits with pupils, who resentful of his exploitation of their talents, had broken their apprenticeships with him ( Mantegna was the most famous litigants). No traces of his collection remain, but it is likely that something of the antiquarian erudition of the university town of Padua rubbed off on the young men who spent time in his workshop. It is impossible to assess any stylistic debt to Squarcione himself, however, as so little is known about his work. 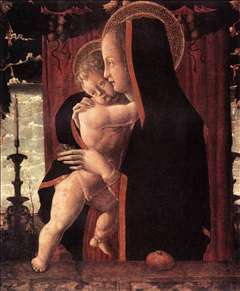 Only two works are known by him, a polyptych of 1449-52 in the Padua museum, and a signed Madonna in Berlin. His traditional role as the founder of a distinctive Paduan style is highly questionable. 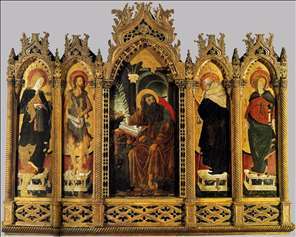 See more details about "De Lazara Altarpiece"